My previous Zebra Cake recipe with Chocolate and Vanilla theme was liked by all and almost the whole cake was completed by my kid. I understood that he liked the pattern in the cake. In his school they used to have week a colour of food or vegetable as a theme. So I had planned to make this cake for the Red Themed week for his snack box in a healthy way by adding Beetroots in the place of chocolate batter and the outcome was satisfying. I was happy that my imagination worked out well finally. I am making this cake egg less version and if you want to add eggs in it avoid yogurt and instead add 2 eggs. I have added lemon juice and zest to give nice flavour for my cake. This cake is Beet root and Lemon flavored Zebra cake. Normally Red Velvet cake has a mild mix of cocoa in it, but since my earlier Zebra cake was with cocoa, i have avoided using any cocoa here (you may add a tablespoon of cocoa if you want). * Do not add baking soda if you are using Self Raising Flour. Immediately add the All Purpose Flour/ Self Raising Flour 1/2 a cup at a time and mix/fold well. In one half add the beetroot puree and mix well until uniformly combined. Now this batter will be little loose(thinner than white batter) in consistency. If the white batter(other half) is thick add more lemon juice to make it thin so that the batter drops from spoon easily. To make the beet root puree, Pressure cook the beet root till soft around 2-3 whistles. Peel them and roughly chop them and puree them as fine paste without adding any water. At the centre of the pan add a tablespoon of white batter then add the beet root batter at the centre of the white batter. Like wise add the whole batter inside the pan in alternative manner till you finish the whole batter. When u add the whole batter in that manner it spread and reach the whole tin in thin layer once u bake the cake, it raises and gives zebra appearance. Bake the cake for about 40-45 minutes or until the skewer comes out clean. How Beautifully made this zebra cake ! like the natural red color......looks yummm! 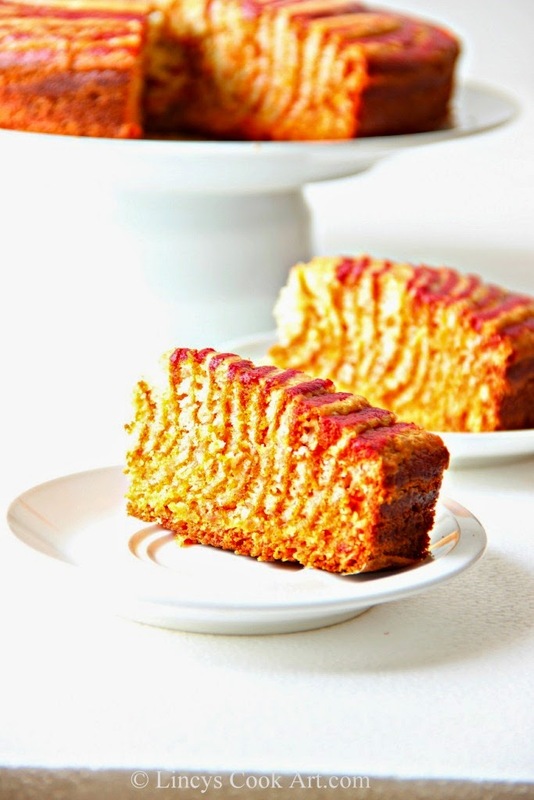 love this red color cake, i still have to try chocolate one. nice cake. Loved the colour.. wow!!! this looks amazing and perfect! thank you for sharing. I'm going to try this.. Beautiful...Loved to have a slice..
Lovely and the beets have given a good red color! Hope your son enjoyed the cake! Beautiful cake and lovely patterns.. Looks very delicious.. Excellent cake and can see prefect zebra layers, love that u opted for natural colour of beets here. Hey lincy Chechi..I just tried to bake it at home, as it is baking I can see that white part is fluffing up more than the red part.I want to make it perfect. Can u suggest ?